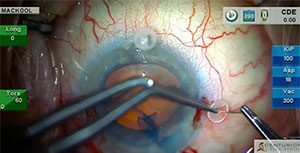 Archive from category "2016 Videos"
This patient has pseudoexfoliation, shallow anterior chamber, dense nucleus, lax zonule and poor pupillary dilation. I have previously demonstrated the use of capsular retractors for zonular laxity, but here we will see the latest version of these devices as modified by Dr David Chang. I also discuss the causes of chopping difficulties, demonstrate “verticalizing” the chopper, use of a CTR, and discuss IOL selection based on intraoperative findings. 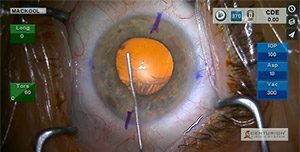 During this case I demonstrate the differences between phaco aspiration vs phacoemulsification of the nucleus, as well as the use of Penetrating Limbal Relaxing Incisions to control astigmatism in a multifocal IOL patient. The PLRI nomograms may be downloaded by clicking on the “PLRI Nomogram” button on this page. Case Description: This man is being treated with Rapaflo because of partial urinary obstruction as a result of benign prostatic hypertrophy, and the drug has caused the iris to become extremely floppy. The video demonstrates several techniques that minimize the chance of iris damage and/or prolapse. A method of toric IOL positioning at the correct meridian in the presence of a miotic pupil is also demonstrated, as are several methods that can be used to maintain pupil dilation in this situation. Case Description: Here is a very unusual case! This 62 year old man has a cataract and severe keratoconus with a refraction of -20.00 D, -11.00 D of cylinder, and K readings in the 80s! However, he is a very successful hard contact lens wearer and therefore does not require corneal transplantation. 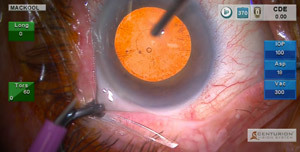 I demonstrate how to improve corneal-induced visualization problems during phaco-IOL surgery, and select an IOL with a power that would leave him approximately emmetropic should he eventually undergo transplantation. In the meantime he will remain a successful hard contact lens wearer with improved vision because of the cataract extraction. 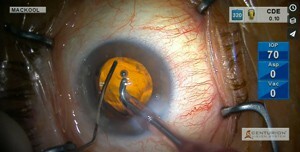 Utilizing high vacuum, removal of a 2+ nuclear cataract is accomplished without ultrasound. This patient exhibits severe corneal gutatta with an endothelial cell count of 368 cells/sq mm, and an extremely shallow anterior chamber. 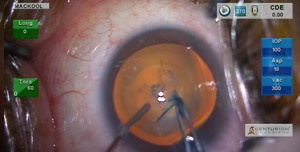 I first perform a pars plana vitrectomy to deepen the anterior chamber followed by cataract surgery using techniques intended to protect the already compromised endothelium. Because of the patient’s anatomy, I again choose to use the Trendelenburg position to obtain better access to the eye. I think you will really enjoy this case! Pseudoexfoliation and a large nucleus that masks zonule laxity is the situation with this eye in which the anterior capsule behavior during capsulorhexis doesn’t alert the surgeon to the true status of the zonule. 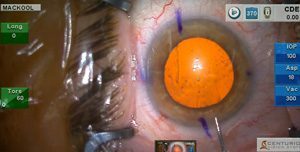 Using Trypan Blue, 360º viscodissection, a back crack technique, special techniques to rotate the nucleus, capsule retractors and a CTR, I am able to perform zonule-friendly phaco and IOL insertion in an eye that continues to bring surprises throughout the case. The video is necessarily a bit long but I think you will really enjoy this one! This month I demonstrate the use of the Trendelenburg position in order to gain adequate access to a “deep set” eye during cataract-implant surgery with toric IOL implantation . 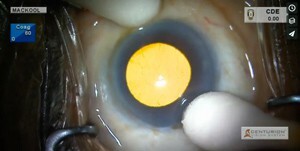 The pupil dilates only moderately, and possible pharmacological causes of poor dilation are discussed: several techniques that increase and/or maintain pupil size are demonstrated, as are methods to chop the nucleus and protect the posterior capsule during subincisional cortex removal.